Companies are always looking for ways that their brand can distinguish itself in a marketplace. 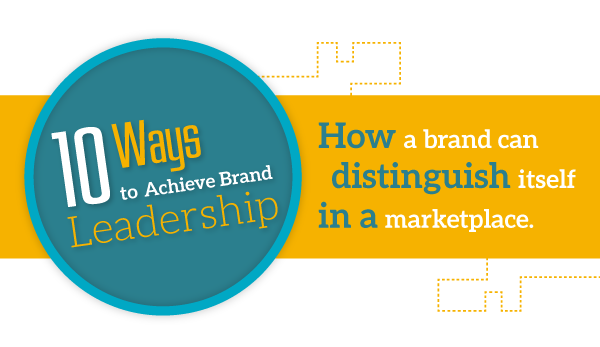 We have created an informative infographic with a quick listing of ways for your brand to achieve brand leadership. Marketers often talk about being a brand leader as if it is one thing. But there are many different ways that a brand can distinguish itself in a marketplace. The critical decision for brand owners is deciding how you will lead and why that will work. Ultimately, how you lead as a brand is decided by what, where and why you compete as a brand. Every brand leader will incorporate several of these elements in their leadership blend: the differences are in how and to what effect – particularly for character. Large or liked? Storied or placed? Profitable or purposeful? These critical decisions about priorities will significantly influence how you compete and how and where you present yourselves across the world.